Pine cones are kind of amazing as home decor if you think about it. You can completely get away with putting them up at the beginning of fall and leaving them out through the winter. They’re just festive enough, but not so seasonally specific that they’re only good for one holiday. What really takes pine cones to the next level is if you get scented versions. They add a subtle fragrance to whatever room they’re placed in. You’ve probably seen the bags for sale at the grocery store, but we bet you didn’t know that you can make your own at home very easily. 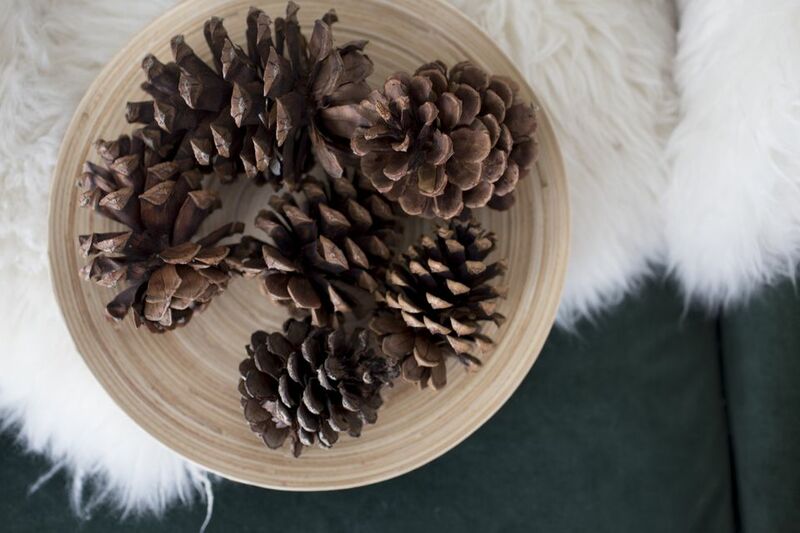 Pine cones can be purchased at most craft stores but we think it’s more fun to forage for them. There is more than one variety and you can choose whatever size and shape you want—plus, they’re free! There are two different methods for applying the scent. You can use a spray bottle for a faster process, or, if you have more time to spare, you can apply the oils directly to the pine cones, which will need to sit for about a week. We chose to apply the oils directly to the pine cones for our project. The only downside of collecting your pine cones from outside is that they're more likely to be dirty, sappy, or have little bugs hiding inside. But don’t let that deter you! It’s pretty easy to clean them. Simply give them a good rinse in the sink and place them on a foil lined cookie sheet. Don’t use dish soap; the scent will linger and mess with the essential oils you’re going to add on later. Bake them at a low heat (200 degrees F) for about an hour. As a general rule, you never want to leave something that doesn’t normally go in the oven unattended. Go with your nose on this one. Really, this is one of those lucky opportunities where you can choose purely based on scent. Other crafts like candle making or DIY perfumes eliminate scents for safety reasons. But here, you can just pick your favorite. While a lot of people like using cinnamon, you can also use apple, orange, grapefruit, vanilla, peppermint, or pine. You can apply just one scent or you can mix and match. Combinations like cinnamon and apple work well together. Or, as the scents fade, you can repeat the process below with a new scent to create a layered fragrance. ﻿There’s no right or wrong way to get your pine cones scented. Just choose whatever method you have the supplies for. The main thing to remember is that the longer you let the scent soak in, the more potent the pine cones will be. If you want to use a spray bottle, fill it with water and add about ten drops of essential oil. Go drop by drop to make sure it smells good to you. It will depend solely on your personal preference. Spray the cones and place them inside your gallon sized freezer bag for at least a day. Remove and let them dry completely before placing around your home. If you don't have a spray bottle or want to try the other technique, place your pine cones in a gallon sized zip top bag and pour essential oil right inside. Again, start with less and add more oil as needed. Seal and shake the bag to spread the essential oil evenly and then place in a safe spot for a week. Remove them and let them air dry before putting them out. Repeat these steps as needed to refresh the scent. Once the pine cones are out for a few weeks they’ll start to lose their fragrance. Once you have your scented pine cones, there are numerous ways to use them. We like to place them in garlands, wreaths, or place them up on the mantel. Enjoy!